Work that I have published either as peer-reviewed and non-peer-reviewed articles and book chapters. Setting, implementing and maintaining health-based guidelines has proved very important in protecting human health. The approach has, however, some important limitations. First, it sometimes happens that, where pollutant levels are lower than guideline values, it is considered acceptable to allow a drift upwards towards those guidelines; or, in an equivalent manner, that policies or developments that imply an increase in pollution are considered acceptable as long as guideline levels are not exceeded. This ignores the possibility of effects at concentrations below guidelines, a problem especially with pollutants that have no threshold at population level. Second, health-based guidelines do not per se take account of the difficulties and costs involved in achieving them, and therefore they are not amenable for comparing the costs and benefits of a new proposal. Third, measures to reduce pollution to conform with limits may have other unintended consequences, including health impacts mediated through other environmental or social determinants of health. Attempts to overcome these limitations have contributed to the development and increased use of other methods of using science to inform the development of policy. One such set of methods is called HIA. All the countries of the UK now have community health and wellbeing as a key policy objective. The UK Public Health Association (UKPHA) strongly supports the use of HIA as a means to achieving better health outcomes in all areas of policy, strategy and development. 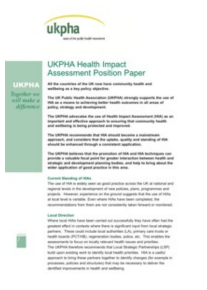 The UKPHA advocates the use of Health Impact Assessment (HIA) as an important and effective approach to ensuring that community health and wellbeing is being protected and improved. The UKPHA recommends that HIA should become a mainstream approach, and considers that the uptake, quality and standing of HIA should be enhanced through a consistent application. 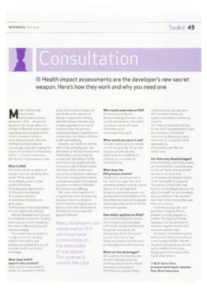 The UKPHA believes that the promotion of HIA and HIA techniques can provide a valuable focal point for greater interaction between health and strategic and development planning bodies, and help to bring about the wider application of good practice in this area. The UKPHA became a part of the UK Faculty of Public Health in 2011. I was one of the team that helped to write this position paper. Everybody needs good neighbours, and in the eyes of most, the Ramsay Street idyll does not include a waste facility. Siting, planning and operating these facilities in most areas is guaranteed to generate community concern. Health, the local environment and quality of life are issues which come up time and again when communities speak out. 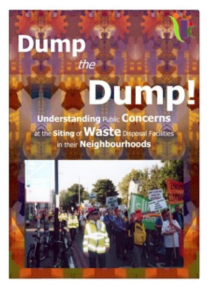 Planning processes for siting or extending waste facilities can become a battleground. Communities can feel marginalised and unheard as waste planners, regulators and operators are perceived to rush through what is seen as the best waste management option. How best then to deal with such community concerns? What approaches and strategies can be used? The two approaches that tend to be used are community consultation and public relations strategies. However, no two communities are identical, and so any form of mechanical community consultation and public relations are almost bound to fail. These don’t address the key difficulties of diverse communities or understand that what works for one community will not necessarily work for another. Authorities are better equipped to focus on the ‘hard’ scientific and technical facts, and so often fail to address the complexities of individual areas. 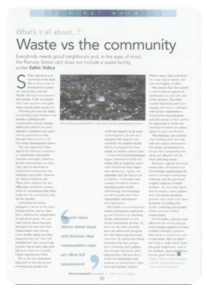 The ‘soft’ value issues about fairness, transparency and trust that communities raise during waste facility siting and planning processes are often left unanswered. Many people are familiar with environmental impact assessment (EIA) - the process by which information about the ecological effects of major projects is gathered and evaluated. Health impact assessment (HIA) is much less well known. However, developers and planners are increasingly using HIA to gauge the impact of a proposal on community health - it can be a vital tool in getting local communities on side. HIA has developed from EIA and the movement to promote "healthy" public policy. It is not mandatory, but aims to influence policy and decision-making. 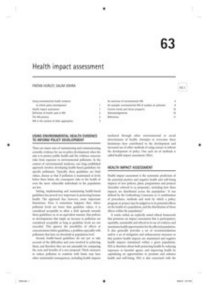 Chapter 2 describes the background, philosophy and methodology of health impact assessment. Chapter 3 describes the background, philosophy and methodology of environmental impact assessment. 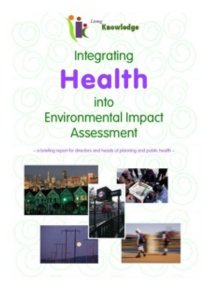 Chapter 4 shows why and how health should be integrated into environmental impact assessment. Chapter 5 examines the issue of having insufficient and contradictory evidence and how this should be managed. Chapter 6 examines the value of stakeholder involvement and engagement in impact assessment. Chapter 7 examines how to commission and scrutinise an integrated environmental and health impact assessment. 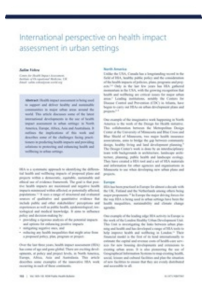 Chapter 8 examines the wider contextual factors that have a significant influence on the integrated environmental and health impact assessment process. This report is based on a three-year doctoral research project undertaken at the London School of Hygiene & Tropical Medicine that was funded by the Economic & Social Research Council and the Natural Environment Research Council on ‘Understanding Public and Other Stakeholders Perceptions of Environmental and Health Risks and Integrating them into the EIA and Planning Process’. Community concerns and protests at the siting of technological facilities in their neighbourhoods have increasingly been recognised as important social phenomena. However, environmental impact assessments (EIAs) undertaken during the planning process have tended to show that the environmental and health risks of these facilities are low. This disjunction in expert and lay discourse has been pejoratively described as NIMBYism (Not In My Backyardism). More importantly, it has led to a risk perception gap developing between key stakeholders, especially residents and risk professionals, that in turn is having four wider societal consequences: a trust-credibility gap, a knowledge-communication gap, a values-ethics gap and a democratic- accountability gap.